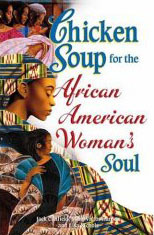 Eve Hogan served as the Senior Editor for Chicken Soup for the African American Soul and Chicken Soup for the African American Woman’s Soul, and was a contributor of two stories in Chicken Soup for the Ocean Lover’s Soul and another story in Chicken Soup for the Soul: Celebrating Mothers and Daughters. Whether you are a mother, daughter, grandmother or girlfriend, these stories of trial and triumph will encourage and inspire you as you feed your soul and soothe your spirit. This candid, touching and inspiring collection of stories proves that the spirit of sisterhood extends beyond geography, economics, age and time. Whether we’re passing on family traditions, keeping the faith or just keepin’ it real, one thing is for sure; we are here because of the shoulders of we stand on. While the stories in this book were written by, for and about African Americans, the impact and power of this book is for everyone! Heartwarming, enlightening and educational. This book is full of inspiring Sea Stories and Wyland’s artwork. Eve Eschner Hogan had two stories selected for this publication: “Octopus’ Garden” and “Ebb and Flow.” Eve is an avid diver and co-owner of Makena Coast Dive Charters on Maui. Eve’s Stories: “Ebb and Flow” page 81 and “Octopus’ Garden” page 100. 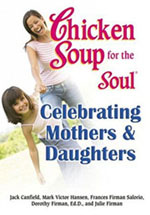 This book is a collection of sweet stories honoring the relationship between mothers and daughters.